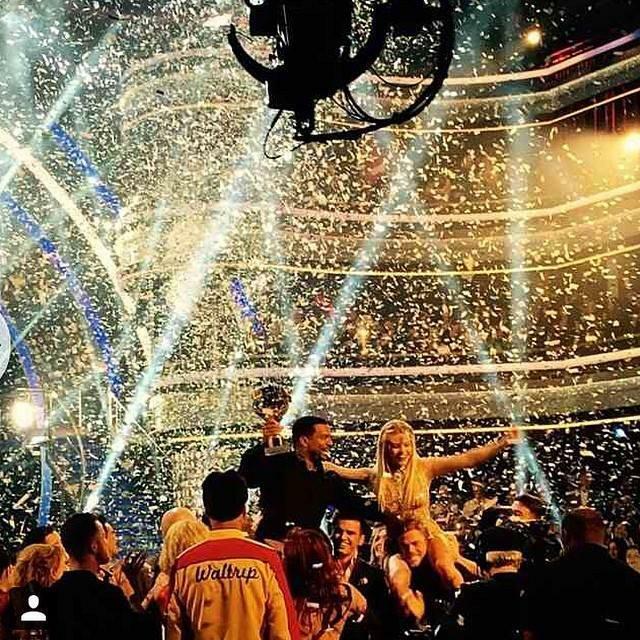 Witney Carson posted this picture from last night's "DWTS" finale. On last night’s finale, the pair scored perfect 10s on their final dance, a cha-cha/Argentine tango before accepting the glittering mirror ball trophy. Ribeiro, who danced on Broadway as a child in The Tap Dance Kid, said he had wanted to be on “DWTS” 10 years ago and every year in between! So charming. Now he’s a ballroom TV champion and heading out on a 39-city tour with “Dancing with the Stars: Live!” beginning December 27. Ribeiro was a frontrunner throughout the season. If you missed everything else, you’ll want to at least check out this clip from the “My Most Memorable Year” episode, when he recalled his time playing Carlton Banks on “The Fresh Prince of Bel-Air.” That was the night, after much speculation and finger-crossing from viewers, he finally did “the Carlton dance,” his signature move from the sitcom. In a student-teacher role reversal, he showed Carson the nuances of the arm swing, and the pair busted it out during their jazz performance to “It’s Not Usual” (Carlton’s preferred accompaniment). They scored perfect 10s, and judge Julianne Hough told him that even though he’d given viewers what they wanted with “the Carlton,” by the end of the season, people would remember Ribeiro as a dancer in his own right.